Greatly increases security. 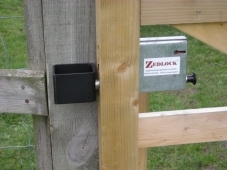 Designed to fit all standard steel or timber gates. With heavy stainless steel bolt, easy to fit with instructions and high security 5 lever lock. The Zedlock is a safer and more convenient alternative to a chain and padlock. All locks can be keyed alike and re-keyed if necessary at any time. Costs less than a chain & padlock of similar security rating. Please note: this item is the assembly to be used when a gate is hung on the face of a timber post. The price of this product is for the assembly only and does not include the lock itself.